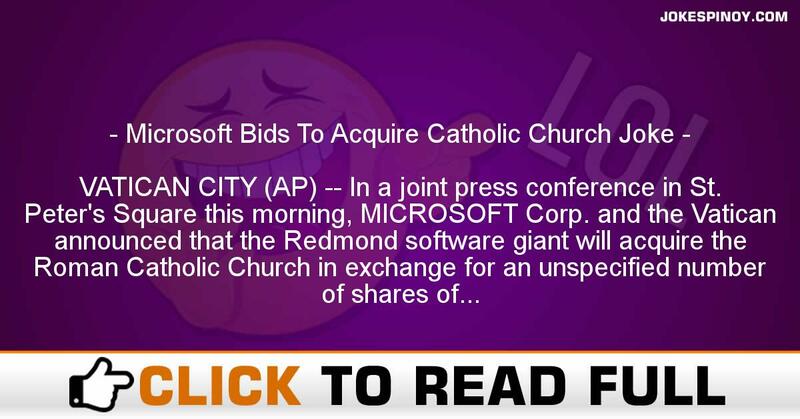 VATICAN CITY (AP) — In a joint press conference in St. Peter’s Square this morning, MICROSOFT Corp. and the Vatican announced that the Redmond software giant will acquire the Roman Catholic Church in exchange for an unspecified number of shares of MICROSOFT common stock. If the deal goes through, it will be the first time a computer software company has acquired a major world religion.With the acquisition, Pope John Paul II will become the senior vice-president of the combined company’s new Religious Software Division, while MICROSOFT senior vice-presidents Michael Maples and Steven Ballmer will be invested in the College of Cardinals, said MICROSOFT Chairman Bill Gates.”We expect a lot of growth in the religious market in the next five to ten years,” said Gates. “The combined resources of MICROSOFT and the Catholic Church will allow us to make religion easier and more fun for a broader range of people.”Through the MICROSOFT Network, the company’s new on-line service, “we will make the sacraments available on-line for the first time” and revive the popular pre-Counter-Reformation practice of selling indulgences, said Gates. “You can get Communion, confess your sins, receive absolution — even reduce your time in Purgatory — all without leaving your home.”A new software application, MICROSOFT Church, will include a macro language which you can program to download heavenly graces automatically while you are away from your computer.An estimated 17,000 people attended the announcement in St Peter’s Square, watching on a 60-foot screen as comedian Don Novello — in character as Father Guido Sarducci — hosted the event, which was broadcast by satellite to 700 sites worldwide.Pope John Paul II said little during the announcement. When Novello chided Gates, “Now I guess you get to wear one of these pointy hats,” the crowd roared, but the pontiff’s smile seemed strained.The deal grants MICROSOFT exclusive electronic rights to the Bible and the Vatican’s prized art collection, which includes works by such masters as Michelangelo and Da Vinci. But critics say MICROSOFT will face stiff challenges if it attempts to limit competitors’ access to these key intellectual properties.”The Jewish people invented the look and feel of the holy scriptures,” said Rabbi David Gottschalk of Philadelphia. “You take the parting of the Red Sea — we had that thousands of years before the Catholics came on the scene.”But others argue that the Catholic and Jewish faiths both draw on a common Abrahamic heritage. “The Catholic Church has just been more successful in marketing it to a larger audience,” notes Notre Dame theologian Father Kenneth Madigan. Over the last 2,000 years, the Catholic Church’s market share has increased dramatically, while Judaism, which was the first to offer many of the concepts now touted by Christianity, lags behind.Historically, the Church has a reputation as an aggressive competitor, leading crusades to pressure people to upgrade to Catholicism, and entering into exclusive licensing arrangements in various kingdoms whereby all subjects were instilled with Catholicism, whether or not they planned to use it.Today Christianity is available from several denominations, but the Catholic version is still the most widely used. The Church’s mission is to reach “the four corners of the earth,” echoing MICROSOFT’s vision of “a computer on every desktop and in every home”.Gates described MICROSOFT’s long-term strategy to develop a scalable religious architecture that will support all religions through emulation. A single core religion will be offered with a choice of interfaces according to the religion desired — “One religion, a couple of different implementations,” said Gates.The MICROSOFT move could spark a wave of mergers and acquisitions, according to Herb Peters, a spokesman for the U.S. Southern Baptist Conference, as other churches scramble to strengthen their position in the increasingly competitive religious market. ABOUT US : Laughter is the very best medicine as the old expression says, we at JokesPinoy.com will provide you with all the amusing filipino quotations and photos in tagalog language. Back in 2013, a group of Filipino OFW (Overseas Filipino Worker) got bored and they attempt to look for some amusing quotes online simply to have fun but unfortunately most of the websites they found on that time are having an aged jokes and have no interaction with the users. From that instant, they subsequently got an idea to build their own jokes website and let other users to give their jokes or opinion together with the present jokes. Following the funds and ideas gathered, JokesPinoy.com was born, a website that let the user share their jokes and let them have conversation with other users too. Since the website has been launch, tens of thousands of visitors are coming each day to read jokes and have fun on the website and too as giving their view on the jokes they read. We expect from JokesPinoy.com this website may give you some smile and happiness, Life is Short so have fun on it. DISCLAIMER: Some of the jokes, photos and videos seen in this site aren't created by us, they may be made by our users or they just get it someplace in the net only like 9gag, youtube, metacafe, vimio and etc. We respect copyright information which is posted here including funny pictures and humorous videos. If encase there are files posted here in our site which is owned by your and you don't want to share it to anybody subsequently fell free to contact us to remove it. Majority of the language used on this site was in tagalog and some are bisaya that are both filipino language which originated from Philippines, should you wish to interpret the joke to english you can used an online translator to translate it from tagalog to english.